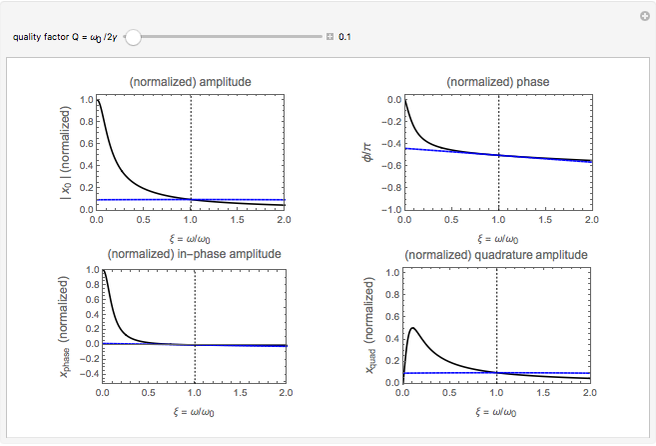 The plots show (solid lines) the frequency dependence of the amplitude, the phase, the in-phase component, and the quadrature component of a driven damped harmonic oscillator. The variable parameter is the quality factor of the oscillator, that is, the ratio of the oscillator's resonance frequency to its damping constant . 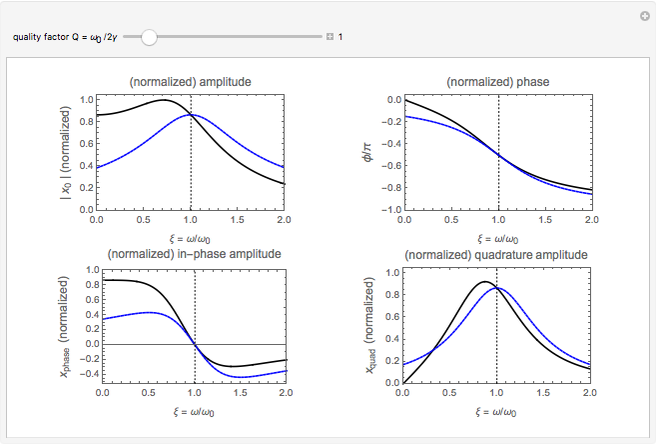 The (normalized) lineshapes are presented in dimensionless frequency units, giving the representations a universal character that can be applied to any driven oscillator (mechanics, electronics, optics, etc.). The plots also show (dashed lines) the Lorentzian lineshapes obtained in the high- limit when . 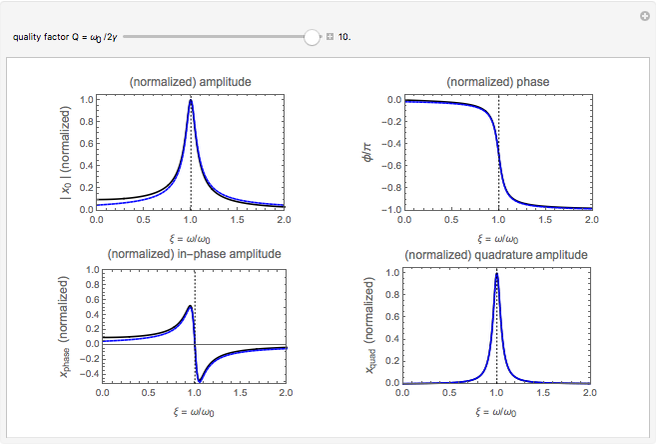 This Demonstration analyzes in which way the (high- limit) Lorentzian lineshapes of a driven damped harmonic oscillator differ from the exact resonance lineshapes. The four resonance lineshapes are shown in the plots as black solid lines. In order to avoid rescaling during the manipulation of the quality factor , all signals are normalized to their largest value. The corresponding lineshapes are shown as dashed blue lines. which shows that the phase and quadrature signals in the high- limit are dispersive and absorptive Lorentzians, respectively. Antoine Weis (University of Fribourg) "Resonance Lineshapes of a Driven Damped Harmonic Oscillator"